Back in February it was revealed that HFZ Capital Group was in talks to bring a “monumental” new structure to a lot at 76 11th Avenue in the Meatpacking District right along the High Line. 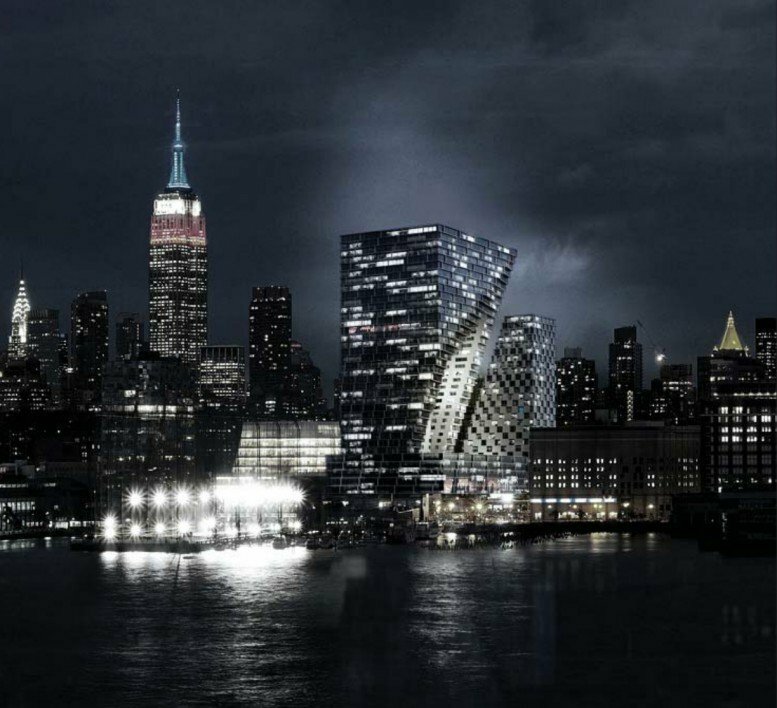 And between shortlisted architects Rem Koolhaas and Bjarke Ingels, in April the developer decided to move forward with starchitect-of-the-moment Ingels for the high-profile project. Now Yimby has our first look at the design that may rise atop the coveted site: two very angular, asymmetric towers measuring 402 and 302 feet, with 800,000 square feet for a hotel, retail, amenities and about 300 luxury condos. 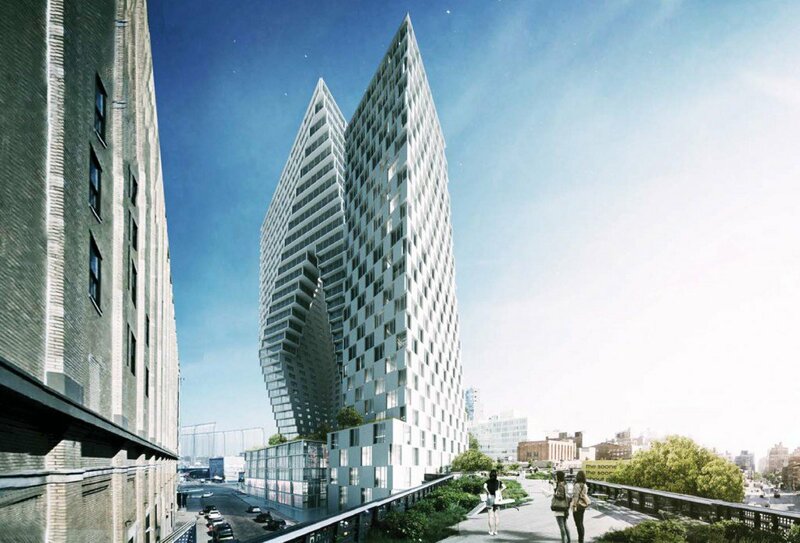 Like Ingels’ 57th Street tetrahedron, preliminary renderings show that the largest of his High Line towers will feature a central courtyard, making for a tornado-like shape, with the smaller tower looking as if it has been cut away to create the void. As Yimby adds, the design gesture also affords units on the southern edge of the western tower views of the elevated park. 50,000 square feet of retail will be situated on the first floor, while the 150,000-square-foot hotel will take up the three floors above that. Residential amenities will also be placed within the dedicated hotel space, while the condos (totaling 550,000 square feet) will take up the floors above. 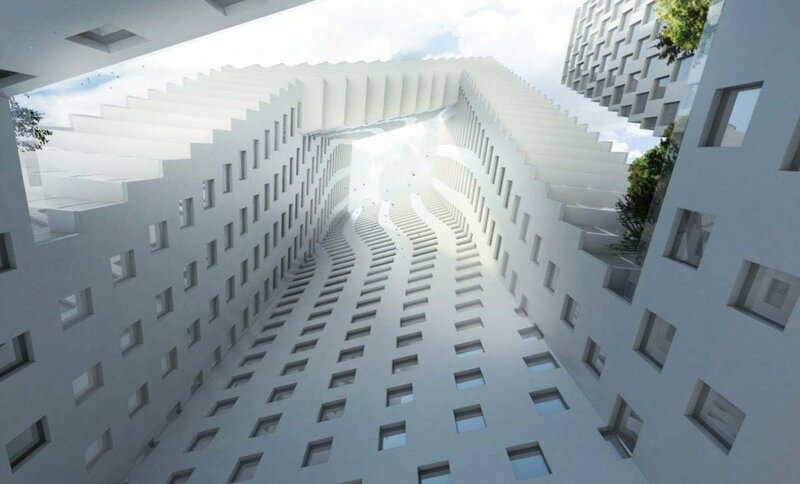 In an interview with Bloomberg earlier this year, HFZ’s principal Ziel Feldman told the paper he was looking to create a “self-contained kind of city” with the design. Previous reports tell us that most apartments will be two- and three-bedroom units ranging from 1,500 to 2,000 square feet, priced at just under $4 million and up—relatively low considering HFZ Capital paid a whopping for $870 million for the lot, the second most ever paid to acquire a development site. A completion date of 2018 has been penned in for the project.